“We’ve hit a timeline point where it’s too late to fabricate, ship, and float the balloons within a reasonably predictable weather window,” said to Jeffrey Roberts, partner at New World Design, Ltd., designers of the lighter-than-air civic demonstration, Flying Pigs on Parade: A Chicago River Folly. This latest news pushes the launch of the installation to 2018, moved from the original plan of this September. Roberts cites the city’s refusal to grant the installation a docking permit and larger-than-expected municipal reimbursables, such as security and sanitation fees, as the reasons for the delay. The city noted the potential for the hindrance of commercial and recreational traffic on the river in its refusal to New World Design. The refusal also referenced concerns about setting a precedent with the event. The design team is still optimistic about the future and says it is continuing the campaign to realize the project. 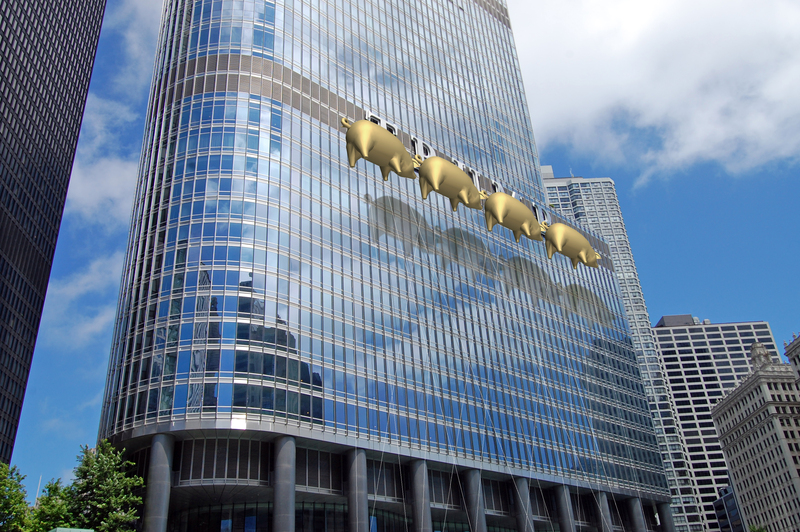 The proposed Flying Pigs on Parade: A Chicago River Folly consists of four golden replicas of the flying pig made famous by Pink Floyd’s 1977 album Animals. The installation has the blessing of Pink Floyd frontman Roger Waters. The plan calls for the pigs to be attached to a construction barge and floated in front of the 20-foot-tall Trump sign on the Trump International Hotel & Tower in Chicago. Donald Trump has not yet commented or tweeted about the project.